In August 2009, Melissa d’Arabian won season five of The Next Food Network Star, beating out thousands of hopefuls for the ultimate dream job: her own Food Network show. As a wife and a stay-at-home mother to her four preschool-aged daughters, Melissa embodies family home cooking at its finest. On her daytime cooking series, Ten Dollar Dinners with Melissa d’Arabian, she shares her tasty recipes and her $10 promise: four people, ten bucks, infinite possibilities. Father’s Day is the perfect time to grill out with the family. Melissa has wonderful tips and ideas on how to celebrate Father’s Day with food. A Mom’s Impression (AMI): What are some ideas of great grilling recipes that kids would enjoy along with fathers? Melissa d’Arabian (MdA): I love to take my girls to the farmer¹s market and allow each one to pick out any vegetable she wants. I then take these vegetables home to make a fun recipe. For Father¹s Day, why not make my Sausage and Roasted Vegetable pasta, using the grill instead of the oven to roast up those vegetables? Each child will have a vegetable represented in the pasta – kind of an edible charm bracelet! AMI: How do you have time to cook nutritious healthy meals and still take care of your family and have a career at the same time? the strategy that works for me. Regarding healthy meals, I’ve discovered that nutritious meals don’t take longer to prepare than unhealthy ones. In fact, healthy meals don’t take longer to prepare than does getting drive-thru most of the time! As for those occasional less healthy meals -and who doesn’t have one sometimes? I say everything in moderation. I’m just doing my best like everyone else. AMI: How do you spend Father’s Day with your family? MdA: Father¹s Day means two things for my husband: sleeping in late and breakfast in bed! And lots of kisses and giggly girls waking him up, glittery, gluey homemade cards in hand. Nothing like a gaggle of little daughters to make a man feel manly; I think it¹s the protective caveman instinct. AMI: Do you have any Father’s Day traditions? MdA: Sleep, sleep, sleep for the dad. I¹ll admit that the one drawback of parenting is that we have been perpetually tired for the past five years, so sleeping in until ten is just the hugest luxury. But, having four little kids who keep us so busy is a tremendous gift, so we consider a little sleep deprivation to be a very high quality problem. To make the crepes: Whisk the flour, sugar, lemon zest and salt in a medium bowl. In a measuring cup, whisk together the milk, egg and 1 tablespoon of butter. Slowly whisk the egg mixture into the flour mixture until smooth. In a heavy small saute pan or crepe pan, lightly brush the pan with a layer of melted butter and heat over medium-high heat. Working quickly, pour in about 3 tablespoons of batter and tilt the pan to coat. Cook for 1 or 2 minutes and then flip with a thin metal spatula to finish cooking the other side, another minute. Repeat with remaining batter. Keep the crepes warm while preparing the rest of the dessert. To make the Blueberry Filling: Heat the jam in a small pan over low heat or microwave until warm and syrupy. Whisk in the lemon juice and set aside. To make the Custard Sauce: In a small saucepan, whisk the sugar, cornstarch, and salt together until well blended. Whisk in the milk and cook over low heat until almost boiling, then remove from the heat. In a small bowl, whisk together the egg yolk and vanilla until well blended. Add a couple of tablespoons of the hot milk from the saucepan and whisk to temper the egg. Add resulting egg mixture to the rest of the warm milk in the pan, whisking to combine. Cook over low heat until the sauce begins to thicken (do not boil). Let the sauce cool slightly while assembling the crepes. To assemble: Spread some of the blueberry filling in a line down the center of each crepe and roll up. Spoon a few tablespoons of the custard sauce on each dessert plate and lay 2 crepes on top. Sprinkle with confectioners’ sugar and serve. New episodes of Melissa’s show, Ten Dollar Dinners, will begin in July. You can learn more at Foodnetwork.com. See more wonderful recipes from Melissa here. Oh my goodness ~ that looks so yummy! I wish I could be that talented to make it too! I am not so sure I can do it to be honest. Practice, practice, practice. Those crepes look delicious, How did you manage to get an interview with her? She seems like she’d be really busy. 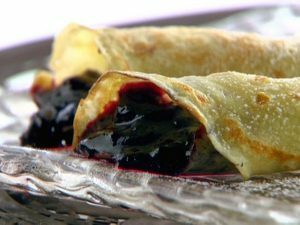 I loved Melissa on “The Next Food Network Star,” and I’m glad to see her show doing so well — I love how she takes sophisticated dishes (like crepes!) and makes them both accessible and easy to make for the home chef. Very cool interview! These look so good! I love Ten Dollar Dinners! Those crepes look so wonderful, gotta try them! That’s it! I’m saving this page and am making these for my hubbie next Father’s Day! Thanks for sharing! Hey maybe I’ll practice over this Christmas holiday!